How to add custom middleware in ASP.NET Core application? Here, you will learn how to create and add your own custom middleware into the request pipeline of ASP.NET Core application. The custom middleware component is like any other .NET class with Invoke() method. However, in order to execute next middleware in a sequence, it should have RequestDelegate type parameter in the constructor. 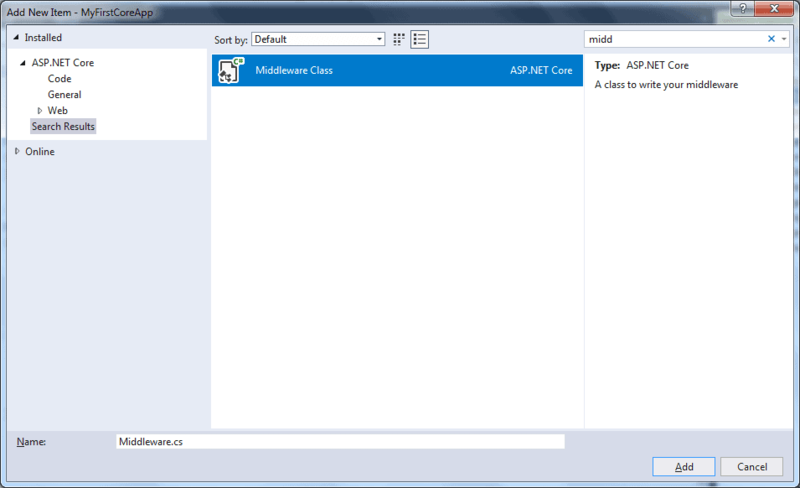 Visual Studio includes template for creating standard middleware class. For this, right click on the project or folder where you want to create middleware class and select Add -> New Item. This will open Add New Item popup. Search for word "middleware" in the top right search box as shown below. Select Middleware Class item and give it a name and click on Add button. This will add a new class for the middleware with extension method as shown below. Now, we need to add our custom middleware in the request pipeline by using Use extension method as shown below. We can add middleware using app.UseMiddleware<MyMiddleware>() method of IApplicationBuilder also. Thus, we can add custom middleware in the ASP.NET Core application.